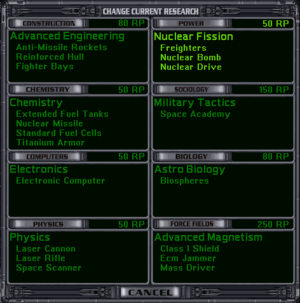 The Research Menu at the start of a game. The highlighted tech area (Power) is being researched. The Computer techs appear in the third row of the left column in the Research Menu. None. You have to research all the Computer techs if the game starts at Pre-Warp. Ship's targeting computer that increases "beam" weapons' chances of hitting by +25%. In practise not noticeably better than no computer. Note: If a computer is damaged or destroyed, the ship will lose the bonus. Miniaturization: Reduces size and cost. Building that increases a colony's research by a flat 5 RP plus 1 RP per scientist. Ship's targeting computer that increases "beam" weapons' chances of hitting by +50%. Not cumulative with other computers. Achievement that makes missiles whose target retreats or is destroyed redirect themselves at the nearest enemy ship or base instead of self-destructing. Can increase the effectiveness of your missiles by up to 25% in the early game. Best choice for non-Creatives: Research Laboratory is essential - if you fall behind in research so early in the game, you're dead (unless you're a blitzer in a small galaxy and you get lucky). Achievement that gives a +10% bonus for both "Spies" (espionage and sabotage against other empires) and "Agents" (your bumbling fools heroic counter-intelligence operatives). Ship Special System that: generates RPs depending on the ship's size (RPs = 1, 2, 4, 8, 16, or 32; the 16 and 32 are for Titan and Doom Star ships, which you can't build until you get the relevant techs); gives a special attack bonus if fighting Space Monsters or Antarans. There are much better ways to increase research and to get attack bonuses that work against other empires as well as against Space Monsters or Antarans. Note: Antarans don't attack you until shortly after turn 220; and it takes almost that long to mount a successful attack on their home world. Ship Defense System that improves defense against boarding parties by +20% to Marine Defense on a ship. But shields that are still functioning stop all boarding parties, giving you time to destroy them while on their way or, even better, destroy their mothership. Best choice for non-Creatives: Neural Scanner; espionage and sabotage are potent weapons in the early game, when warships are slow and weak. Particularly essential for Democracies, which are weak in counter-intelligence. Ship's targeting computer that increases "beam" weapons' chances of hitting by +75%. Not cumulative with other computers. The first targeting computer that is worth using in offensive operations. Building that increases a colony's research by a flat 10 RP plus 2 RP per scientist. Building increases a colony's morale by +20%, which improves all of farming, industry, research and income. See Strength through Joy for an example of how useful a Holo Simulator can be. Best choice for non-Creatives: usually Supercomputer, the large boost in research early on may be decisive. However, blitz races may choose positronic computer if they are is a good position for an offence. If research is important to you at this stage of the game, only consider Holo Simulator if very short on cash and are Subterranean. Of course, you may be of the mindset that all research only provides a temporary advantage as it will eventually be taken through spies, trade or conquest. All of your hard work on research is liable only to be taken away to give everyone else an advantage and deprive you of the opportunity cost of more colonies, buildings and conquest. You probably won't be assigning any colonists whatsoever to research and will have a massive spy network, even if you still build research buildings for some automatic RPs. You probably already have stolen Supercomputer by now anyway. For Creatives this tech level is the "end of the beginning". Colonies with four or more scientists should if possible stockpile production so they can build a Supercomputer immediately and a Holo Simulator on the next turn. Colonies that are going to build warships should usually omit the Supercomputer and build the Holo Simulator, then move some workers into research until a Pollution Processor is built. Achievement that enables you to equip warships with missiles that have the EMG modification, which can be deadly against enemy ships, particularly the Antarains, who have no shields to block EMG missiles. Miniaturization: not by further Computers research; you can miniaturize the missiles by research in Chemistry‎. Ship Special System that improves "beam" weapons' chances of hitting at long range to the same level that they previously had at one-third of the range. Achievement that gives a +10% bounus for both "Spies" (espionage and sabotage against other empires) and "Agents" (counter-intelligence operatives). Ship's targeting computer that increases "beam" weapons' chances of hitting by +100%. Also improves your chances of shooting first if you play with the "ship initiative" option on (see the military sections of this guide for details). Not cumulative with other computers. The first targeting computer that is effective against ships that have a defensive bonus; hardly ever misses against other ships. Building that produces 30 RP without needing scientists. At this stage of the game it's good on planets with scientists and amazing on planets without (which are probably the majority at this stage); typically increases an empire's research by 50%, sometimes more. When you start researching Autolab, all colonies should if possible stockpile production to build one immediately. You should already have strengthened you finances to handle the maintenance. Ship Special System that doubles all "beam" weapon damages that penetrates the target's shields. Deadly when coupled with a good computer and good beam weapons. It's effective agaist warships. Star Bases, missiles, fighters and ground-based defences (although atmospheres halve the effective power of "beam" weapons). Best choice for non-Creatives: very difficult, as all three techs are extremely desirable. Hardly any can afford to take Structural Analyzer. Those who expect serious combat soon (offensive or defensive) and want to use "beams" take Cybertronic Computer and must attack quickly before those who take Autolab get a significant lead in technology. This tech level is Creatives' most important payday - a few later ones may have equally large effects, but this one changes the game for Creatives: Autolabs enable them to research military techs fast (and Stock Exchanges, which they should build as early as possible, to meet the high costs of an invasion campaign); Cybertronic Computer + Structural Analyzer + reasonable "beams" kill larger enemy fleets fast ("beams" are best for Creatives because missiles lead to wars of attrition, which Creatives can't afford as they are generally slow at ship-building). Robotic "colonists" that can only farm but each generates 3 more food than a normal colonist (excluding Natives) in the same environment. Its productivity is not influenced by racial or government bonuses or penalties, but is enhanced by agricultural technologies that have been "built" on the colony. It does not contribute to a colony's cash income. All Androids are Tolerant (see note below). Robotic "colonists" that can only do industrial work but each generates three more PP than a normal colonist in the same environment. Its productivity is not influenced by racial or government bonuses or penalties, but is enhanced by construction technologies (both buildings and achievements). It does not contribute to a colony's cash income. All Androids are Tolerant (see note below). Robotic "colonist" that can only do research but generates three more RP than a normal colonist in the same environment. Its productivity is not influenced by racial or government bonuses or penalties, but is enhanced by research buildings (but not by the Heightened Intelligence Achievement, see Biology). It does not contribute to a colony's cash income. All Androids are Tolerant (see note below). They cost 60 PP to build, and 1 PP per turn to maintain. They do not contribute BC to the treasury. They don't suffer from any gravity penalty. They create 3 more production units than is standard for a race with no bonuses. They do not (slowly) reproduce. They are Tolerant, i.e. they can have a higher population than usual for a planet class and size, as well as supplement other populations above their limit, up to the androids' limit. Because they are not affected by pollution, gravity, and don't make credits, the buildings specific to those if present on an android-only colony will only cost credits to maintain without providing any benefit. Because of androids' production bonus (net of their credit loss) they will easily outperform organic populations without credit multipliers such as Spaceports and Stock Exchanges. However these multipliers cost production to make and credits to maintain, and only with an organic population of around 8 or higher are they worth building. Populations of this size can't occur on toxic and radiated (if you're lacking the radiation shield) as well as Tiny planets, so it follows that they are best populated solely by androids and with only buildings suitable for them. It is generally an either-or situation, a planet should be either designed for androids or for organics. Of course, you can also use Tolerant (or better yet, Sub Tolerant) captured races for small or larger non-terraformable planets as well, as for terraformed medium or larger planets organics are the clear winners with their credit multipliers. Small planets can go either way depending on your situation. Of course, if a planet is not terraformed to Gaia level then the androids' population capacity is still higher than the organics' capacity and they can supplement the organics to fill whatever space they won't fill, although the planet should still be treated as an organic planet with pollution control, credit and gravity structures. Since Unification gives a massive 50% bonus to production (not applicable to androids), it's optimal on ALL planets to have the maximum organic population with the rest supplemented by androids for races with Unification. Since Androids can be transferred just like organics, "completed" planets with their full complement of buildings can send androids to new colonies to spur their growth. In addition, this can give you quick population growth if your meatbag population is not breeding fast enough. Best choice for non-Creatives: the one that strengthens your greatest weakness. For example most Unification empires, especially UniTol, will usually prefer Android Scientists. On the other hand most research-oriented races will prefer Android Workers; and cash-rich Democracies can afford to populate small Rich or Ultra-rich planets entirely with Androids, turning them into very powerful shipyards. Android Farmers seem the least useful option in most cases, but cannot be completely ruled out as food is the hardest resource to produce. On the other hand, where Androids shine the most isn't going to be farmable anyway! Achievement that raises morale on all colonies by +20% immediately and at zero cost. See Strength through Joy for an example of how useful a 20% morale boost can be (the example uses a Holo Simulator; Virtual Reality Network is even better). Building that increases a colony's research by a flat 15 RP plus 3 RP per scientist. Best choice for non-Creatives: most go for Galactic Cybernet. However, Virtual Reality Network is also highly viable, since by this stage most colonies are terraformed and bursting with people so increasing all production by +20% immediately with no maintenace costs is a good idea. And wouldn't your research effort be better off with more than three spies from the PP that the Cybernet would have cost for each colony, net of the lost morale bonus including the ones that don't need to farm anymore? If you've already stolen everything then these decisions are a lot easier, and in some cases you won't have to make one at all. Building increases a colony's morale by +30%, which improves all of farming, industry, research and income. See Strength through Joy for an example of how useful a morale-boosting building can be. The best Ship's targeting computer, increases "beam" weapons' chances of hitting by +125%. Not cumulative with other computers. Only misses against Battleships or smaller warships that have either a +50% defensive bonus or a Displacement Device; hits anything else almost 100% of the time. Also maximizes your chances of shooting first if you play with the "ship initiative" option on (see the military sections of this guide for details). Note: this is the only computer that the Antarians use. Ship Special System than enables "beam" weapons to bypass the target's armor including Heavy Armor (they must first penetrate the shields) and triples the chance to damage weapons and other essential systems (and often causes drive explosions). Achilles Targeting Unit + good computer (at least Cybertronic) + good "beams" = mass murder of enemy fleets, and genocide if also supported by Structural Analyzer and High Energy Focus. Best choice for non-Creatives: excruciatingly difficult - non-Creatives should hope the game does not get this far. Considering the situation for non-Creatives, the Virtual Reality Network a tech level back improves morale, is built immediately in all colonies and do not maintenance. The Pleasure Dome has to be built and has maintenance. This level is not often reached in competitive games, but it's a huge payday for Creatives, for whom 1 Battleship can sometimes destroy 4 to 6 non-Creative Battleships per combat turn (remember that Creatives also get Structural Analyzer and by this stage have probably also got High Energy Focus + Megafluxers; and at least Anti-Matter Drives). If you get Achilles Targeting Unit, it initially requires a lot of space; miniaturizing it a couple of levels by Hyper-advanced Computers research allows you to add significantly more weapons, with gruesome consequences for your enemies. This page was last edited on 13 July 2015, at 03:33. This page has been accessed 39,070 times.